Road Less Travelled: Double Decker Root Bridge A Living Legend! Like the saying goes 'A Journey of a thousand miles begins with a single step,' our long trek to the Double Decker Living Root Bridge in Nongriat village commenced from Tyrna village. The Double Decker Living Root Bridge which is 250 years old is in a remote village 'Nongriat' and is accessible only by trek. 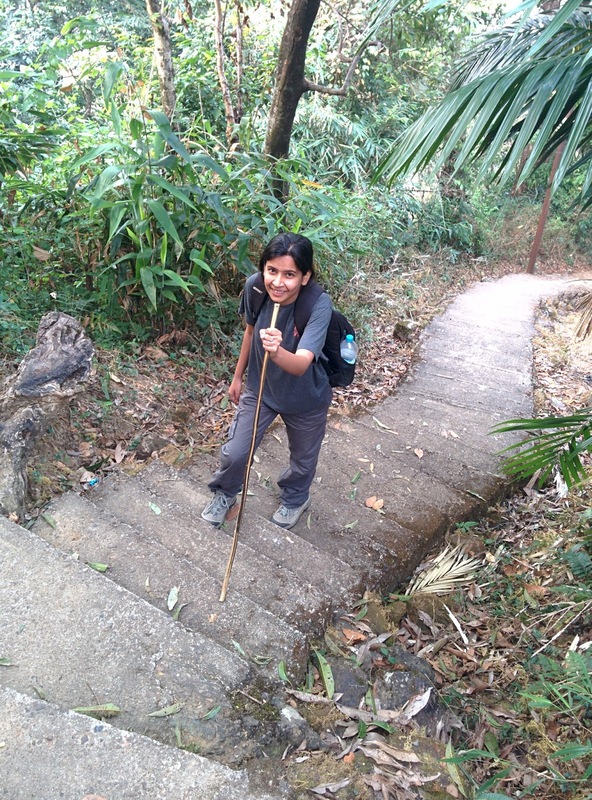 There is no doubt that it is a challenging trek involving a steep climb of over 3000 steps. However, let this not keep you away from this place. Despite being a little challenging trek, it is very much doable. There is a motorable road until Tyrna village and from here a 3 km hike to the Double Decker Living Root Bridge begins. We crossed two tiny villages which have around 40 homes and small shops set up by these villagers served as hearty refreshments stops. The trek took us through some excellent beautiful green forest and two amazing long iron rope bridges that run over crystal clear blue river. The source of the water is of the Nohkalikai falls. The natural pools formed here are breathtaking. The iron bridge sways when one walks on it and on the very first one we had butterflies in our tummy. For someone who has a fear of heights, it was scary initially but being a water baby the sight of the turquoise blue water was enough to bring a smile and worked like a charm in conquering the fear and crossing the other ones got exciting. The pathway to the root bridge is almost 99% cemented and the whole trek could be divided into 3 legs. First leg is pretty easy and less time consuming with long and neatly spaced out steps. Second leg is the most challenging as the steps are really small and the descent is almost vertical. One needs to be careful during this second leg as a single mistake could make you tumble down. As we finished the second leg, we reached a fork and to our right was a single decker living root bridge- "Jingkieng Ri-Tymmen," the longest of all and is 120 year old. The unique thing about this bridge is that it is the only one to take help from two rubber trees. The rest of the root bridges are all offshoots of a single tree. Only a short seven minute walk from the fork leads you to this root bridge. Backtrack to the fork and the path to your left continues to the Double Decker Living Root Bridge. From here it is only 45 minutes and this final leg is not as challenging as the second one. En route we came across interesting small cemented box like structures and we could spot bees hovering around it. We were told that the smart villagers have opted for an easy way to procure honey that is by trapping the Queen Bee in these cement structures. Obviously the worker bees follow the Queen and start building a beehive collecting nectar making it simple for the villagers. The villagers need not go looking out for honey rather they have made the bees come to their backyard simplifying the process of collecting honey rather than climbing steep ridges and tall trees. These indigenous traps are hard to miss as there are many en route. This region has abundant bay trees and the entire trek path is covered by dried bay leaves. These flavorful leaves are dried, collected and then sold in the market for as little as Rs.25 per kilogram. We came across villagers wearing tattered or no footwear carrying massive loads trekking all the way. In spite of the hardships that these people face for their daily survival, we still see them wearing a smile on their face going about with their routine. A big contrast to the rest of the so called "urban folks" who have all the comforts and luxuries in life but still seem to wear a frown on their face and find reasons to complain at the slightest chance of discomfort. As we approached the first iron bridge, we caught a glimpse of an abandoned Living Root Bridge at a distance on our left that runs parallel to the iron bridge. This bridge now defunct was once used by the villagers to cross over the river. Throughout the trek path there are several such amazing surprises and interesting sights that make the whole experience of traveling memorable. This is the beauty of trekking, you never know what wonders are in store for you. These paths takes you deep into less explored territory offering virgin natural beauty at its best. Such experiences make you want to forget everything else, live and enjoy the present moment. Of course, there are others who do not consider the journey worthwhile but are more focused on reaching the destination ruining the entire experience. In the end if they just sulk, whine and complain about how much more distance needs to be covered, its their loss! The village of Nongriat welcomed us with an amazing little root bridge and from this little root bridge we were able to catch a glimpse of the majestic Double Decker Living Root Bridge. The work and skill of the village people in growing such a monumental bridge left us spellbound. The ingenious creativity, skill, hard work and most important patience is super amazing. The lengthy process of creating such a wonder starts with planting a sapling of the rubber tree. Fast forward 25 years, the tree grows and the off shoots are meticulously channelized to the other side with the help of hollow betel nut tree trunks. Slowly and steadily the bridge takes shape and after 25 years is ready for ferrying people for the next 500 years. This feat is nothing less of a miracle. The Double Decker was not built to attract people from all corners of the world but the whole purpose behind building these monumental living root bridges was to help the villagers cross over rivers. During monsoons, due to the high amount of rainfall this place receives the gentle stream becomes monstrous resulting in floods and the villagers were swept away due to strong currents. To overcome this, the root bridges served as a lifeline during monsoons. In the case of Nongriat root bridge it so happened that the water levels of the river surpassed the under bridge leaving the villagers helpless and completely cut off again. This resulted in them building another tier above the bridge and the Double Decker Living Root Bridge came into existence. After growing popularity of this bridge, to further boost tourism the villagers are creating another monumental feat by growing another tier to this living root bridge from the same tree. This would promote the Double Decker Root Bridge to a colossal and even more unbelievable Triple Decker Living Root Bridge. The root bridges grow in strength every passing day. As of December 2015, the roots have actually reached the other bank. If you want to see how the Living Root Bridges are grown or nurtured, head to Nongriat within the next couple of years. The calm waters running under the bridge are so crystal clear and serene that it would make a perfect place to kick off your walking shoes, put your feet in cold water, have unending conversations with your loved ones with a view of the root bridge and to add on, enjoy a free fish spa. The trek does not just end here at the bridge. 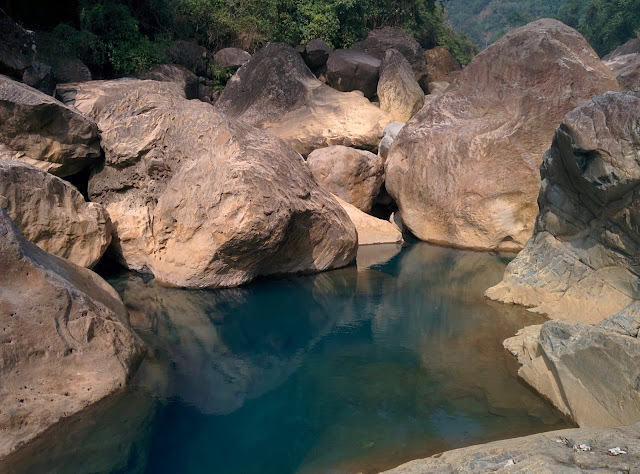 For the more adventurous souls, a further hike of 3 km and after crossing 2 more living root bridges and 2 iron bridges, a small deviation from the trek path leading to Rainbow Falls took us to an amazing and secluded natural swimming pool. The water here is crystal clear and we could actually see the bottom of the river bed. A very proud moment as Indians that our country has such gem of destinations. No fancy infinity swimming pools at the best of hotels across the world can even come remotely close to such natural beauty. It is so inviting and would be a sin to not jump in. But be warned that the pools are quiet deep and the under currents are very strong during monsoon. Always respect Nature, don't take chances with your life, you have only one. Another very interesting aspect here is the marine fossils that could be seen on the boulders. Though for this one needs to hike a lot it is totally worth it. The small cafe at the entrance of Nongriat village serves lunch and thanks to them in this remote location we had piping hot yippie noodles. The villagers are such nice people. They charged us only Rs.30 for a single plate, given the remoteness of the place, they are at the liberty to charge any exorbitant price.This goes on to show how generous and nice these folks are. There are only 2 stay options at Nongriat Village on either sides of the root bridge. The first one is 'Serene home stay' (PH: 9436739655/ 9615252655) that charges Rs.300 per bed and food at an additional cost. The other guest house (PH: 8575787340) with 4 rooms that have 2 single beds run by the village community. They charge Rs.400 per room and food here too is available at an additional cost. We did not stay here but had a glimpse of the rooms and they are very basic but provide beautiful views of the living root bridge. Also, imagine having the entire bridge to yourself all day and night. If one is not able to carry their bags, word is porter services can be arranged. The descent is relatively easy compared to the tough and draining steep uphill hike. While trekking up from the Double Decker Root Bridge it would be best to climb up slowly and steadily. Set a tempo and try and stick to it. It is a pretty long and time consuming trek and we took 7 hours to complete the entire trek. It would be wise to start early, leisurely enjoy the trek and spend a lot of time at the sights you want. Take adequate breaks and get back to Tyrna village before sunset. 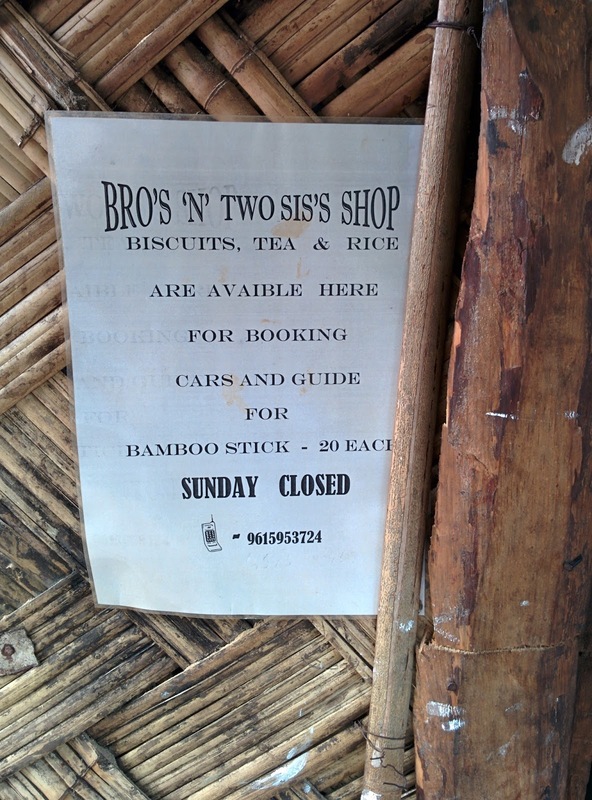 The very first shop at the start of the trek "Bros N Two Sis's Shop" rents out bamboo sticks at Rs.20 each. This would simply be one of the best lifetime investments that you could make. During the hike, this serves as your third leg. If you really want to visit the Double Decker Root Bridge but have serious health ailments or are differently abled there is still hope and you can visit the bridge. The solution is to request the villagers to carry you in a makeshift palanquin but kindly make sure that the arrangements are made well in advance. During the entire trek we crossed 6 root bridges apart from the Double Decker Bridge and 3 iron rope bridges. A reliable guide and also POC for porter services and room reservations who prefers to be called "Batman" can be reached at 9856892992/ 9402399350. Your only other stay option is the amazing "Cherrapunjee Holiday Resort" in Laitkynsew Village. The resort is 5 km away from Tyrna. This is your only and best stay option in the entire region. They have 3 categories of rooms and all rooms are very spacious, have attached bath and 24 hr running hot water. This amazing property is set atop a hill and offers panoramic view of the village. The resort serves excellent food and is managed and run by very professional and courteous locals. They took care of our every single need in the most efficient manner. Since this area is pretty remote, they provide cab from the resort to Tyrna, the start point of the trek and also arrange for guides at nominal charges. 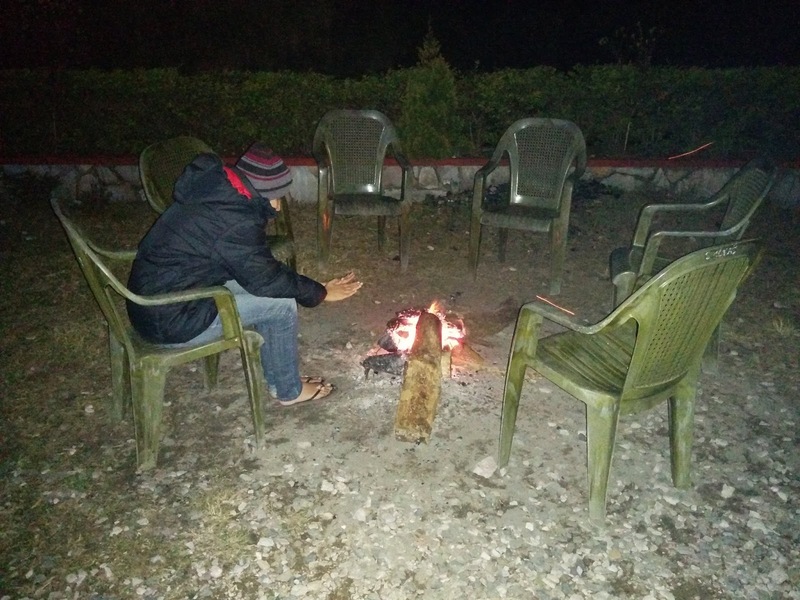 Every evening we had bonfire to keep ourselves warm. They also organize local folk music at a cost of Rs.100 per room. So true Manu, such a wonder Meghalaya is. May you plan your trip soon. Thanks Antarik, glad you enjoyed reading the post. NE is so addictive that you would certainly not stop even after multiple visits. Wishing you a great trip. This looks so mystical and out of the world. Loved the first picture!!! Thanks actually Pics don't do justice to the beauty of this place. Hope you visit the living root bridges soon. Happy travel! How long does it take to reach Serene Homestay from the starting point of the trek? 4 pm in our opinion is a little too late to begin the trek. Sun sets quite early in North East India. With luggage, distance and trek path taken into consideration it will minimum take 5 hours to reach the home stay. I would recommend you to stay in Cherrapunji holiday resort and leave early the next day to the home stay. Or reach Tyrna village early in the day. Hope you have a wonderful trip. Will it be possible to experience this with a three year old toddler?? 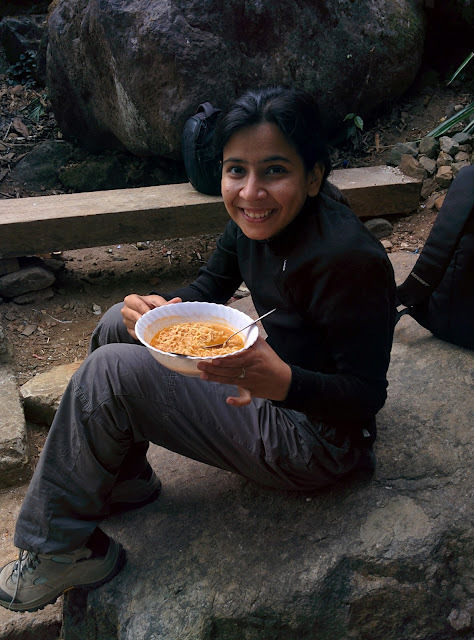 It's really mesmerising..
Hi Kavita, while we don't want to discourage you from traveling. In our opinion we feel it would be tough on you to do this trek with a 3 year old. Thanks a bunch for such kind words. Glad you subscribed to our travel blog. Happy Traveling. Thanks Ram and Reshma. Very useful for planning the trek. Keep writing and keep guiding us. Thank a lot. Thanks Nirav, glad to be of help. Have a great trip. We are a group of 17 member's completed the trek with in six hours;actually we started the trek LATELY and reached the root bridge at afternoon.We enjoyed there for 4hours and return we started at 5:30pm and reached down the starting at around 8:30pm.Damn we had to use mobile flashlights during our return.Its very dark.We are bit scared during our return.So I suggest all to start early. The population can be divided into two one who visited Nangriat double decker root bridge n the other who haven't.Luckily I belong to the first category.At the age of 60 I made it along with my 35yr old daughter n 9 yr old grand daughter.A life time achievement I have been proud of n made me realize that health alone is wealth.Except kneecap n stick nothing else I had except self confidence.Still I feel happy over it n motivate others to explore.Thanks to Kasi tribes. Hey.. which month did you trek this ? And total how many hours trek to reach doubke decker living bridge ? Hi Kunjal, we did this trek in the month of November. It takes roughly 2 to 3 hours to reach, depends on your level of physical fitness. Have a great trip. Thanks a ton, glad you liked our post.